This kind of language runs rampant in our society and has no doubt made its way to your office. Clients who struggle with weight and food issues get caught in a vortex of shame, preoccupation and hopelessness. Trapped between the rigidity of dieting and the chaos of overeating, every day can be an emotional battle that may exacerbate or even result in low self-worth, eating disorders, anxiety or depression. Treatment of these issues is more than a matter of weight loss or self-control. In fact, many times these very interventions do more harm than good! Join Judith Matz as she shows you how to help your clients identify the shame that is woven into the diet-binge cycle, challenge unhelpful thoughts and feelings, and repair dysfunctional relationships with food - no willpower necessary! Articulate the differences in clinical presentation between Binge Eating Disorder, disordered eating and emotional overeating. Examine the relationship between societal “diet culture” and its influence on disordered eating patterns that present in clinical treatment. Utilize CBT-informed interventions to address distorted thinking patterns in order to help clients normalize eating and incorporate positive, sustainable behaviors. Provide psychoeducation for clients regarding the relationship between overeating and emotional regulation skills. Teach clients the three essential steps of attuned eating in order to replace disordered eating patterns, including binge eating. Identify personal bias toward body size and implement Health at Every Size (HAES)-informed strategies in the therapeutic relationship. 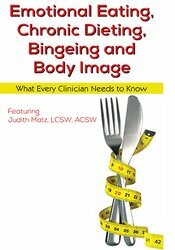 Judith Matz, LCSW, is the co-author of two books on the topics of eating and weight struggles. Beyond a Shadow of a Diet: The Comprehensive Guide to Treating Binge Eating Disorder, Compulsive Eating and Emotional Overeating has been called “the new bible” on this topic for professionals. The Diet Survivor’s Handbook: 60 Lessons in Eating, Acceptance and Self-Care was a #1 bestseller on Amazon and a favorite resource for therapists to use with clients. She is also the author of Amanda’s Big Dream, a children’s book that helps kids to pursue their dreams – at any size! Judith has a private practice in Skokie, IL, where she focuses her work with clients who want to get off the diet/binge rollercoaster and learn to feel at home in their bodies. Through her individual counseling, groups, workshops, presentations and books, Judith has helped thousands of people to develop self-care skills that increase physical, emotional and spiritual wellbeing without a focus on the pursuit of weight loss. Through educational programs, she is dedicated to helping people end the preoccupation with food and weight. Judith received her MSW at University of Michigan, and earned her post-graduate certificate at Michael Reese Hospital in Chicago, where she trained in the treatment of eating disorders. Financial: Judith Matz is in private practice. She receives a speaking honorarium from PESI, Inc. Non-financial: Judith Matz is a member of the Association for Size Diversity and Health (ASDAH). PESI, Inc., PE001, is a Continuing Professional Education (CPE) Accredited Provider with the Commission on Dietetic Registration (CDR) from July 1, 2018 through June 30, 2019. Registered dietitians (RDs) and dietetic technicians, registered (DTRs) will receive 6.0 continuing professional education units (CPEUs) for completion of this program/materials. Continuing Professional Education Provider Accreditation does not constitute endorsement by CDR of a provider, program, or materials. This self-study program/material is designated as LEVEL 2. Nurses completing these self-study materials will earn 6.3 contact hours. Expires: 10/18/2021. PESI, Inc. is an AOTA Approved Provider of continuing education. Provider #: 3322. This self-study course qualifies for 6.0 self-study contact hours or .6 CEUs in the Category of Domain of OT and Occupational Therapy Process. The assignment of AOTA CEUs does not imply endorsement of specific course content, products, or clinical procedures by AOTA. Course Level: Intermediate. Expires: 10/18/2020. PESI, Inc. designates this self-study activity for a maximum of 6.0 AMA PRA Category 1 Credit(s)™. This activity was originally recorded on 10/18/2018. It was last reviewed on 07/27/2018 and is valid until 07/27/2021.